This weekend I installed SteamOS. I did it to a new harddisk, so I wouldn't break my old installation. Otherwise this was the first SteamOS install I did to an actual hardware. I put together a small summary. That EULA in middle means that you'll still get some fraction of waiting after you get back to your computer. They should seriously consider moving it to the very end, or very beginning of the installation process. Optimally you should just remove the EULA, but assuming you can't do it. Otherwise installation should be quite simple. Make sure most things can be configured afterwards. For those things that can't be configured afterwards, make it possible to configure them long before installation takes place so that the actual installation process would be quiet. This should really apply to any Linux distribution. The login seems nice, except that whatever you're doing next after a fresh install will require you to check your email. I do it with web client and it was not obvious how to get the browser open before being able to login into the steam. I had to set the desktop mode on, return to the desktop and browse my email there. This is a bit weird detail. The Steam client has been isolated to it's own user. Although this makes the system a bit safer, the steam did not seem to reach much over the desktop. For example. It looks like I have to use the big picture mode to chat with friends in steam. In the desktop mode I noticed that the desktop had smooth animations. Although nauseating, they are pointing out that the video drivers installed right without additional measures. The audio didn't work though. That must be a bug because it's lot simpler thing to get working than video drivers. Suddenly it's okay to hurt the eyes with extreme contrasts. They could consider nicer desktop theme. I found an option to change the keyboard layout on the desktop mode, but it did not affect the steam. Since I use the dvorak layout, that was a bit annoying that I couldn't change the option system wide easily from anywhere else except maybe the console. 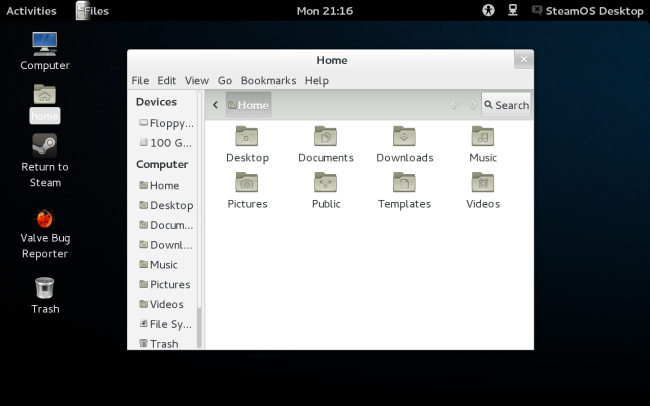 I just can't stand at the composited gnome desktop. I would have changed it and probably add myself a single user with steam client. That isn't too much different from my current linux installation so I decided to get back to that. There are not that many things that tell debian and SteamOS apart. And there probably shouldn't be in the first place.